In this post, I decided to do something a bit different and write about my personal background rather than debunking woo, explaining a logical/scientific concept, or any of the other things that I usually do on this blog. The embarrassing reality is that I wasn’t always a skeptic, far from it, in fact, and I think that my journey towards skepticism (a Fallacy Man origin story, if you will) may be helpful and instructive both for people who are currently on a similar quest for truth, as well as my fellow skeptics who are endeavoring to teach science and critical thinking. Because of my background, I have an atypical perspective on things that I hope will be both enlightening and encouraging to others. Therefore, I will explain my background, as well as directing several comments specifically to those who reject “mainstream” science (as I once did), as well as comments to my fellow skeptics. Note: although this is specifically about science, it all applies to political topics as well, and people on both sides of the political spectrum should consider it. I was raised in a very conservative Christian home, where I was taught to believe in a literal interpretation of the Bible, including young earth creationism (i.e., evolution is false, the earth is 6,000 years old, Noah’s flood was a real historical event, etc.). Nevertheless, I’ve been interested in science for as long as I can remember (particularly paleontology and zoology), and if you had asked the 8-year-old me what I wanted to be when I grew up, I would have passionately told you that I wanted to be a scientist. As a result, my parents furnished me with a multitude of books, but they were always given to me with a caveat. Namely, I was told to ignore all of the sections on evolution, and in addition to the actual science books, I was supplied with numerous books from Answers in Genesis and other creationist organizations so that I would learn the “truth” about the history of life and wouldn’t be led astray by the devil’s lies (that is literally how evolution is viewed among my family members). I want to pause for a moment to make two quick clarifications. First, I am not attacking religion. As I have repeatedly stated, this blog is about science, and my posts only deal with religion as it relates to science. So, if you want to both believe in God and accept evolution, the big bang, etc., then I don’t really feel the need to debate you here (that isn’t to say that discussions about the existence of a God aren’t worth having, but simply that they aren’t within the scope of this blog). Second, I want to be clear that I am not attacking my family. Although I now disagree with them on a great many things, I still love and respect them. I appreciate the home that I was raised in, and I appreciate the fact that my parents really did foster my love of science by buying me tons of books, chemistry sets, microscopes, etc., putting up with me converting the back yard into a “dig site,” letting me bring home all manner of animals as pets/study subjects, tolerating me dragging home dead animals to dissect/reassemble their skeletons, etc. (I was a strange child, if you haven’t figured that out). Getting back to my origin story, by the time that I graduated high school, I was thoroughly vested in young earth creationism. I was also extremely argumentative (a trait that I’ve never outgrown), and I was quick to pick fights over evolution. Indeed, I was one of the people who would get on the comments sections of blogs like this one and viciously defend creationism. I even wrote my high school senior term paper on why evolution wasn’t true, and in my college freshman speech class, I gave a speech about why abiogenesis wasn’t true. I got A’s on both assignments, and at the time I thought that my arguments were rock solid. Looking back, however, I can see the numerous scientific inaccuracies and logical fallacies that I was committing. Although creationism was probably my biggest scientific blunder, it was far from the only one. I also denied anthropogenic climate change (although less adamantly), and was seriously mistaken about many other more minor aspects of science. Vaccines and GMOs were never hot topics in my household, so I didn’t know much about them at the time, but given my gullibility and inability to think critically, I am quite certain that I could easily have fallen for anti-GMO and anti-vaccine propaganda as well (indeed, I have a relative who is still a young earth creationist and still denies climate change, but he is now also opposed to vaccines/GMOs and believes in all sorts of woo). The point of all of this is simply that going into college, I was as far from a skeptic as I possibly could have been, even though I was very interested in science. Now, you may think that I’m about to tell you that during college I took a bunch of science courses and they opened my eyes…but you’d be wrong. During my freshman year, I was quite impervious to facts. I was a biology major, so my freshman schedule included a zoology course, during which evolution was a frequent topic, but rather than seeing the errors of my ways, I clung to my misconceptions. Indeed, I was the type of student that you see on Youtube videos debating professors when the topic of evolution comes up, and I was totally deaf to their facts and well-reasoned arguments. So, if science courses didn’t make any difference, then what did? The answer may surprise many of my fellow skeptics/scientists. It was a philosophy course. During the first semester of my sophomore year, I took an introductory philosophy course, and that class literally changed my life, because it did something invaluable: it taught me to think critically. It taught me the rules of logic and how to tell the difference between a good argument and a bad argument. It exposed my biases and made me realize just how blind and arrogant I was being. That course provided a revolutionary light bulb moment that has literally shaped my entire life since. It gave me my raison d’être. It was my mutated-spider bite, my exposure to gamma radiation, etc. I distinctly remember sitting in my dorm room feeling simultaneously empowered by the logical tools that I was being given and horrified by how gullible I had been. Following that course, there was no going back. I wanted more. I wanted to get better at critical thinking, and most importantly, I wanted to actually understand the way that the universe worked. I was finally willing to challenge my views, and that is exactly what I did. I took more philosophy courses to hone my logical skills, I started actually listening to professors and considering their arguments, and I started questioning everything. I took each of my core views and for the first time in my life, I critically examined them. I actually tried to find problems with them, rather than blindly defaulting to the counterarguments I had been raised with, and if I’m honest, it was not easy or fun. I suffered many sleepless nights and spent months reading, studying, debating, and talking to people on both sides of each topic, but unlike every previous debate I had been in, I was trying to learn rather than trying to win. It was a slow and painful process that cost me friends and strained my relationship with my family, but it was worth it, because one by one nearly all of my core views crumbled. I suddenly could see the problems with the arguments that I had always used, and once I saw them, I couldn’t ignore them. As a result, I made a 180 degree turn on almost everything. My views on science, politics, ethics, religion, etc. all changed, and I emerged as a skeptic. After that transformation, I continued to try to learn, both professionally and personally. Professionally, I went on to earn a Master’s degree in biology, and I am currently approaching the half way mark for my PhD. Personally, I continued to read and study as much as I could about skepticism, logic, and critical thinking. This ultimately lead me to join the skeptic movement and start the blog that you are currently reading. I often have people accuse me of being a paid shill (I make no money off of this, btw) or some other such nonsense, but hopefully you can now see that I am actually doing this because I care about this. I am deeply indebted to the philosophy professor who opened my eyes, as well as to the skeptic blogs, websites, books, etc. that helped me when I began wrestling with my views and beliefs, so the least that I can do to repay that debt is to join in the fight. With that in mind, I want to do several things in the remainder of this post. First, I want to speak directly to the creationists, anti-vaccers, climate change deniers, naturopaths, etc. who read my blog. Second, I want to provide some advice for my fellow skeptics, and finally, I want to offer a brief word of encouragement to the other people who devote their time to defending science and teaching critical thinking. This quote comes from Tim Minchin’s excellent UWA 2013 graduation speech. It is worth watching in its entirety. I want to encourage you to embark on a journey of discovery like I did. I understand how you think and why you hold the views that you do, because I used to be one of you. I realize that you are not consciously dismissing facts and that you truly believe that the evidence supports your position, because that is exactly how I felt. I really thought that I was right, and it seemed totally reasonable to me that the entire scientific community was involved in some sort of massive cover-up to avoid admitting that they were wrong. It seemed totally rational to me that everyone who disagreed with me was ignorant, biased, or corrupt, and I never once thought that I was denying science. Rather, I thought that the facts were on my side and I was simply one of the few people who was enlightened enough to see the truth. Further, I thought that I truly was fact checking. I had convinced myself that I had actually looked at both sides and was rationally assessing the facts, and that deluded self-conviction led me to 100% surety that I was right, when in reality, I was totally wrong. All the belief in the world doesn’t make something true, and no amount of personal conviction can change facts. So I encourage you not to fall for the same cognitive biases and pitfalls that once ensnared me. In hindsight, my errors are obvious. I was engaging in what is known as motivated reasoning. Creationism and many other views were core convictions that I held. They were fundamental parts of who I was. As a result, any time that I was faced with evidence against them, I would subconsciously issue a red-alert and raise my mental shields. I would find some way to convince myself that my opponent’s arguments were false. For example, when I encountered evidence for evolution, I would immediately go to sources like Answers in Genesis, find an article or argument that agreed with me, then cling to that as evidence, even if it was total nonsense. I was so biased and so committed to creationism that I could not see my errors, and totally nonsensical creationist claims seemed to make perfect sense to me. I can distinctly remember particular debates where I used one creationist trope after another, my opponent soundly defeated every last one of them, yet I walked away feeling victorious. That’s what motivated reasoning does, and it is extremely dangerous. It prevents you from ever realizing that you are wrong, no matter how clearly wrong you actually are. My point is simply this: I understand you. I know that you aren’t stupid, crazy, uneducated, etc. I know that you really think that you are correct, but you aren’t, and you will never be able to see that until you are willing to be wrong. Now, you might respond to that by insisting that you have actually carefully considered both sides of the situation (I would have said exactly the same thing), but have you really? I hadn’t. Actually think about this for a minute. Have you actually tried as hard as you can to disprove your own views, or have you simply looked for evidence to support them? As useful exercise, I want you to consider what it would take to convince you that you were wrong. In other words, what piece of evidence would be sufficient to discredit your view? If you can’t think of any reasonable evidence that would make you change your mind, then you have a very serious problem, and you are almost certainly engaging in the same type of motivated reasoning that misguided me for years. First, I would like to offer some constructive criticism. It is very, very easy to fall into the trap of thinking that skeptics are somehow special. It is easy to write off everyone else as crazy idiots, but that type of thinking is both wrong and unhelpful. If you honestly think that you are somehow vastly superior to everyone else, then you need to get over yourself. We all have flaws and cognitive biases, and we can all be led astray by misinformation. For me personally, my past is a constant and painful reminder of just how susceptible I am to cognitive biases and motivated reasoning. I am admittedly speculating here, but I really don’t think that I am an exception, and I think that under the right set of circumstances, anyone could be duped by pseudoscience. On that note, I want to state explicitly that skepticism vs denialism isn’t about being smart. My IQ did not magically increase when I rejected creationism, nor was my brain’s computing power boosted. I was the same flawed idiot that I was before. The only differences were that I was willing to be wrong and I had been taught the necessary logical tools to tell whether or not I actually was wrong. In other words, it is easy to think that the people who disagree with you are crazy or stupid, but most of them aren’t. Most of them are perfectly sane people who are capable of being very rational in most aspects of their life. So intelligence is not the problem. Rather, the problems are biases and an unwillingness to be wrong. Those are difficult things to correct, and denigrating the people that we would like to convert (so to speak) isn’t helpful. To be fair, I have been guilty of this myself on multiple occasions, because it is a very easy trap to fall into, but I think that it is important the we acknowledge the flaws in this approach and try to keep our arrogance in check. Having said all of that, I want to conclude with a few brief words of thanks and encouragement. Being a public skeptic is time consuming, frequently unpleasant, and often seems pointless, but it really does make a difference (at least it did for me). I cannot begin to express my gratitude for the women and men who wrote the skeptic books, blogs, websites, etc. that helped me to shake off my biases. Similarly, I am indebted to the people in forums, chat rooms, comment threads, etc. who took the time to debate me and point out my errors. You all have made a tremendous difference in my life, and it is a debt that I can never repay. Also, here again, I don’t think that I am an exception. There certainly are some people who will never change their views, but there are also people who are willing to challenge their preconceptions and embrace new ideas, and public skeptics do an incredible public service by taking the time to reach and help those people. So thank you all, and keep up the good work. This is a battle that is worth fighting. This entry was posted in Uncategorized and tagged cherry picking, evaluating evidence, evolution, rules of logic. Bookmark the permalink. Your backstory really hit home for me and gives me hope for humanity. I was a born skeptic and have/had a lot of troubles coming around to be anything but cynical about this world. My backstory could not be more different from yours while we seem to share so much from our environment. I was always a very privileged kid. I grew up in a medium income household, my parents were at times struggling but they always managed to give my brother and I everything we needed to start life without worries. Intellectual curiosity showed quite early on my side, I could not wait learning to read and then read books on my own. I loved reading, and the written word, from all art forms I have been exposed to during my upbringing and even later life, always held a special place for me. Writing was not on my mind immediately, I had terrible sense of grammar and correct spelling, because my mind would reproduce words how I remembered hearing them by the voice that narrates thoughts in my head, not necessarily by how they are supposed to look. Then again, I was not too terrible at articulating or communicating. Yet, the first time I brought down words to paper was out of despair, mostly cognitive dissonance created by rejected love during puberty. I felt the depths of my feelings are to private to talk about, yet too precious to be ignored, so I confined them to paper. I never really wrote diary, and I am kind of glad that I do not have to revisit my naive predispositions about the human condition any more. Still, a big mold for my personality would be carved out during that time, to be replaced and refined in the future by maturity. This was also the time when my thinking started, as weird as that sounds. I have very little recollection of the time before my inner analytical voice started keeping records of my thoughts, I could not tell you what I was thinking when I was in elementary school. I wasn’t, or at least I wasn’t me. Yet after my thinking started, life changed. One of the first major things was to reject any notion of god. I remember when I was around 13 years old and I would openly question the existence of god in class; at the time my home country was mostly secular but with a long history of deep Christianity; my grandmother would traumatize us kids with stories about the devil and hell, and regular church visits were still forced on us, as well as taking part in religious rites like communions. My religious teacher at the time was an old, kind man, and he would not try to indoctrinate too much, rather tell stories about the history of religions, including others than Christianity. Most kids were not interested or believers, but none would feel the need to challenge any assumptions laid out before us. Except for me, that is. I challenged a lot of things, the authority of my parents (which did not fare too well with my well-meaning but rule-abiding mother) the qualification of teachers (they were not pleased with my insubordinance at all), or in general the status quo of things I did not particularly like or understand. Mostly however, at this time, I was constantly seeking, never at rest, never at peace. I remember Nietzsche’s Zarathustra, the transformation stages humans have to live through on their spiritual journey away from god. First, we are born as camels, the metaphor goes, carrying a heavy load of old ideologies and morals bestowed onto us. Yet we are wandering through the desert, growing bitter being taxed by their burden. The camel is not free. Only the metamorphosis to a lion allows us humans to be king of this desert, to become free by rejecting everything. Yet, freedom created by rejection does not equal freedom to create. I was a lion for a long time, hungry, seeking, trying to understand a world that needs so much rejection. Luckily, I was not too extreme, a mix of well-parenting, a few influential teachers, especially my long time karatedo sensei, and the virtual reality of videogames provided enough emotional stability or distraction from my devastating thoughts to have a mostly normal happy upbringing with no major depressions or existential threats, materialistic or psychological. Don’t get me wrong, I always liked to dance close the cliff, feeling the pull of the void, yet being able to stare down and walk back unharmed repeatedly released me of a paralyzing fear many humans experience once they inevitably reach that point. If there is one thing I am thankful for or proud of, is that by coincidence of genetics and chance of environmental factors my mind is quite capable of abstraction and thus emotional distance. Once sharpened, harnessing analytical thinking can be a powerful tool against fear. I remember reading once a statement from Elon Musk, who supposedly said he had always been afraid of darkness as a kid, but then he learned how light actually functioned and that darkness was just the absence of photons. Thinking back, I recognize myself in that, because I realized somehow that the unknown is not something to fear, it is just the absence of knowledge. Suddenly questions like “Is there a purpose of existence?”, “What happens when we die?” “Am I useless and disposable for this world?” do not carry such a heavy weight, their previous gravity just a mere memory. Knowing that the unknown is just the absence of knowledge and nothing to be feared on its own, I regularly visit it, think about it, trying to approach its boundaries analytically with the curiosity of a child. The third metamorphosis. This attitude predisposed me to open up my mind and find myself in good company with authors of the ancient or present, and the immortal words of Goethe, Hesse or Nietzsche falling on fruitful ground. Never did I understand my emotions to rejections before reading “Sorrows of the young Werther”, or my denialism to god before articulated through Zarathustra, or my struggle to make sense of the world like Siddharta. Literature got me far, shaped my belief in the fundamental unity and goodness of humankind, as well as our shared struggles, strives and sorrows of being conscious and unknowledgeable of our own existence. While literature lessens the burden of humanity’s shortcomings, I grew dissatisfied with the sheer size of what is unknowable. More through coincidence then consciousness, I found myself increasingly interested and captivated by the body of knowledge called science. The beauty of science was its coherence and connectedness, the skeptical investigation of what necessarily holds true amongst all possible explanations, thus slowly approximating an irreducible truth of the universe we all inhabit. Science is the most audacious human endeavor ever undertaken by our species, a struggle to unify subjective realities to discover patterns of how the universe works for every conscious being, not just our own gullible individual brains. If I were to ever understand the world, only science could help me. I became a scientists, in its classical sense, a wondrous child, a skeptical thinker, a lover of logic and rationality, a humanist and an optimist. Only then I could understand that my whole life I have been pessimistic, a cynical lion tearing and shredding ideologies of others with razor-sharp logic, a devil’s advocate, a challenger of beliefs. Diplomacy was secondary to truth, attack on falsehood always justified. It took more maturity to realize that I could not tear other beliefs down without offering better answers; I would either face forceful and irrational rejection to my claims or succeed in making others feel miserable. Thus is the human condition, constant self-deception as survival mechanism against the void of the unknown. The reality informed by scientific investigation holds up to skeptical thought, and it is a beacon of hope against the darkness of the unknown. Science is the only lifeboat for a skeptical thinker like me, because it is anti-dogmatic, because it is growing and expanding its light. I was a skeptical destroyer for too long to not remember how cynical life can look if one looks too close or too deep into things. Today, I understand the deep need for humans to understand their existence, and why they flock to pseudoscience or religion because of it. Instead of condemning their weakness, I should have admired our shared humanity. Instead of fighting and insulting them, I should have offered a helping hand. It is not too late. If I can change from being a cynical pessimist to an empathetic optimist after almost two decades, maybe others can change too. Your story shows me that we can, and this gives me more hope than you can imagine. I’ve lurked on your page for some time now, as I find it an absolutely invaluable tool for understanding logic. I am a somewhat recent de-convert, and your blog has helped me on more than one occasion to understand or clarify something. It (and you) are an invaluable resource. Your backstory is eerily similar to my own. In fact, our paths were virtually identical (minus the dissecting dead animals bit, sorry – that’s all you ;p) until college. I went into engineering specifically because biology was too evolution-centric. I was encouraged to learn about evolution only through the lens of Ken Ham and his ilk, and was absolutely convinced I had defeated and exposed it as a fraud on a fundamental level. As biology so intimately depended on this lie, I knew I had to avoid it. I turned my analytical mind toward engineering instead. I do not regret this decision at all, but it’s an interesting thought experiment to imagine what sort of physicist or biologist I might have become had I not been so indoctrinated as a child. Thank you for this blog, and for your honest and respectful treatment of your opposition. You’re a class act, I hope you keep it up for a long time. Any comments on why, if your logical skills were impaired, you got A’s on the high school and college papers arguing against evolutionary theory? Were those initial teachers afraid to risk their jobs by pointing out the errors of your arguments (assuming you or your parents might complain to the administration), were they unprepared to actually be teachers (given their own inadequacies in logical analysis), did you go to Christian schools where many already agreed with you, or is this simply an instance of “when the student is ready, the teacher appears”? Do you try to educate non-skeptics? One of the difficulties that skeptics face, of course, is the challenge of educating the non-skeptics. You certainly present your younger self as a challenge. 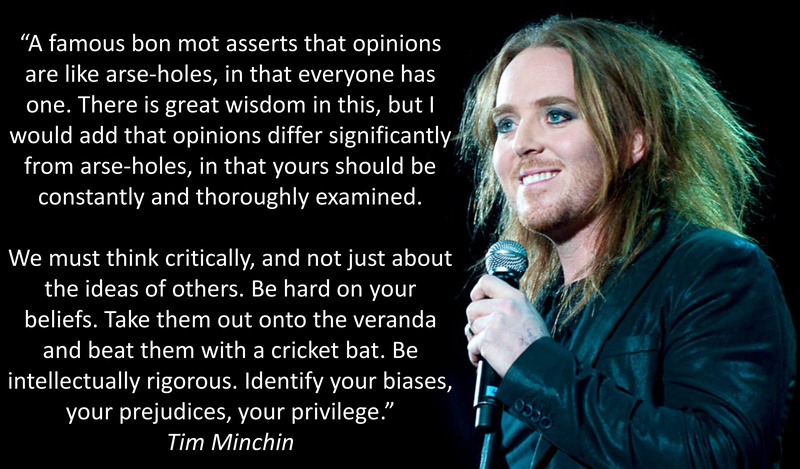 BTW, nice quote from Tim Minchin. As far as why I got As, there are several things that I think occurred there. First, during high school, I did in fact go to a Christian school, which probably had a huge influence on my grade. The speech class was not, however, at a Christian school. So I think that the second component is simply that a big chunk of the grades were writing and public speaking skills (which are both things that I at least like to think that I am fairly good at). In other words, the assignments where judged more on whether or not I could present an argument in a coherent fashion, rather than on whether or not my argument was correct. The final component is simply that neither of those teachers were really trained on logic or science, and like many pseudoscientists, I had mastered the art of sounding like I knew what I was talking about. So to someone without a background in science or logic, I could construct an argument that sounded convincing. As far as educating non-skeptics, yes, I absolutely try. That is one of my goals with this blog 🙂 Now, whether or not I am successful is another matter entirely, but I certainly try and think that it is worth the effort. Having said that, my background is a big part of why I write posts in the way that I do. I spend so much time on logic in most of my posts because that is what made such a big difference for me, and I really think that most non-skeptics simply haven’t been taught those critical thinking skills. Also, I have in the past taught a college level introductory science course, and every time that I taught that course, I spent a week going over the basic rules of logic before moving on to evolution, climate change, or any other “controversial” topics. Excellent, excellent article. I can identify with quite a lot of what you say. My background is similar to yours in conservatism (my dad was a preacher) but I think that I was a skeptic at a younger age (never got baptized, questioned religious beliefs, etc.). I too loved science, but I also loved literature and the arts. An assignment on Nietzche in high school opened my eyes a bit but like you, it was a requisite Intro to Philosophy course in college that really jolted me awake and I have been a free-thinker since. I too am grateful for the authors and the bloggers who sacrifice their time to shine a beacon of enlightenment to help others find their way. I include you too in this group of mentors. Kudos and thanks! Thank you for posting this. I, too, grew up in a similar situation, although instead of religion, my mom was a anti-vaccine, alternative medicine, new ager. I don’t know how many times I defended her alternative medicine and lifestyle, but I definitely felt superior. Oh, and just as for you, all the scientists were participating in a huge cover up. I found out just over a year ago that she is extremely mentally ill, which is a huge part of why she believes in these things, and that was finally what allowed me to let go. But because of that, I am still sorting out fantasy and reality. Somethings were obvious, others are not. Thanks for sharing this. Very interesting, very well written. I’ll keep this short, because others have commented at length. I’ve been a mathematician, scientist, and engineer in various combinations for almost 50 years One of the most important things I learned about science during that time was that a proper scientific hypothesis has value only if it can be disproven, or, in other words, be falsifiable. This echos your words about being willing to be proven wrong. Of utmost importance. Like it is to a number of commenters, your story is quite familiar to me. I was never very good at science, and I never quite so zealously adopted my parents’ beliefs, but I had the conservative Christian upbringing and later learned logic and logical fallacies and began to (try to) see where I and others kid ourselves instead of changing our minds. Thanks for telling your story. Thank you for what is perhaps your most personal blog post to date. I have a personal interest in stories like these: they really help me understand (and respect!) people with different beliefs and views — something that I have always had difficulties with because of my personal issue with Asperger syndrome. What is most revealing for me is not a particular belief per se, but the process by which it evolves or changes: that teaches me more about a person than their most emphatically expressed but unchanging creed. Thanks again for sharing. I’m a regular to your blog and I especially find your pieces eye-opening, helpful and always offering something new for me to learn. I’ve especially been grateful for your listing citations; I’ve become quite a big reader because of this. Your story hit home, and it hit home hard. In my case, it wasn’t philosophy that changed my mind though- it was a really strange opportunity that arose where I actually managed to prove myself incorrect. It was in an English class, a technical English class early in my studies…but it was related to my field. We started a project that was meant to show us how to read, find and tell the difference between reliable and unreliable sources. I was so convinced that I was going to find exactly what I was looking for to prove what I already believed… but I found none of what I expected. Not even a tiny piece. Throughout this journey, asking for assistance, getting more opinions on whether what I was looking at was what I THOUGHT I was looking at… It finally dawned on me that I was wrong. So very, incredibly, horribly wrong. That’s when it clicked that… if I was wrong about this- then how many other things am I wrong about? People ask why I bother, why I don’t just ‘let people do whatever’. Well, the answer is simple; I know what it’s like. When you live in the world of conspiracy and denialism… there’s no telling how far down the rabbit hole we will go (and let me tell you, sir, I was really far down that rabbit hole.) To live that life, for me (as I remember and compare it to now) was a life of paranoia, of anger at just about everything, anxiety about everything all the time… and about stuff that I now know to be completely harmless or totally irrelevant. If I can help just one person escape that- it’s worth it. If I can help just one person make a different choice that might save themselves some greif, or another person some of the same greif… It’s worth it. The day I actually provided a sound enough, kind enough, wealth of information to a friend who was being lead down the anti-vaxx path that she changed her mind… That she will now choose to vaccinate and protect her babies… that’s the day I’m still doing it for. We need this. We need more people like you. Because though it may seem so small… It can make a whole world of difference down the line. Who knows how many people you’ve made just stop and think for just a second… that may have been enough to change just one thing. And that’s pretty much perfect. Apologies for seemingly rambling. Mildly emotionally charged response. This piece is much appreciated. Thank you for sharing your story. Very interesting. I myself lost my religious faith (loose Canadian Anglican family) when I started college and reading philosophy, especially Bertrand Russell. My roommate liked going to church for the music so she dragged me to about a dozen during that first year of college. By the end of the year, I no longer believed in a god or any religion. Am a writer, not a scientist, but enjoy learning about the world and think our hope lies with science and clear thinking. Your blogs are so enjoyable. For myself, was really into UFO and psychic books when I was a kid. Yet at some point I can’t remember before starting university, I got into skepticism. Maybe it was reading Asimov. As to religion, as a science student I tried to cling to some sort of abstract deism. It was taking philosophy that made me realize that i could not defend this position rationally. As to the contents of this post, i think it is very important for us to understand ‘weird’ beliefs first as sociological phenomena and only second as failures of rationality. This sort of post is a highly salutatory contribution to understanding how not-crazy people believe crazy things. Thank you. I have not come here before, but I love the side margins, especially the chemical arrow-pushing and tensor equations. Tres cool.